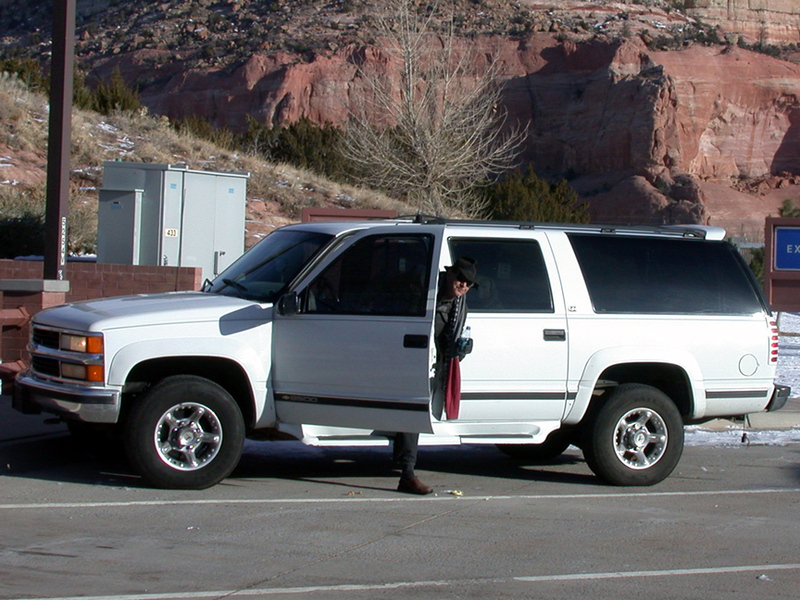 Back in January of 2006, I first agreed to accompany Larry Bell on a road trip to Taos. It was shortly after we had decided to have an exhibition at my gallery. The trip was Larry’s idea. He thought that I should “check out his scene” at the Taos studio, and learn about the making of his iconic glass cubes. Two nights before we headed out of town, we had been at dinner at Hal’s restaurant in Venice. Ed Moses asked Larry, “Are you driving back to New Mexico alone?” Larry replied: “Not if I can convince this guy to go with me.” I decided to go. To make it out of Los Angeles before the worst of the traffic, Larry picked me up at my house at 5 a.m. He was prompt. He surprised me by picking up my bags, and carrying them to the truck. I quickly realized: this is a very caring and open host, and we are going to have an adventure. On that trip, we headed east on the 210 at dawn on Sunday morning. Larry was driving his white Chevrolet Suburban, which he dubbed “The Mighty Time Machine”. We were getting close to the intersection with interstate route 15 north. Larry said, “I love the light in the morning. Especially like this, or at the beach.” I realized right then that this is what he’s all about—the perception of light and space—and that this will be the meaning of my road trip with Larry. He talked again about the morning sky: “Look at those flying saucer clouds. I’ve never seen clouds like that.” The sky was full of subtle gradations of radiant color, from a rosy glow to a soft, infinite blue—just like a Larry Bell cube. There was a vapor trail from a passing jet that ran from the upper right straight back toward the horizon, and just above that were the three flying saucer clouds, smaller in size as they grow more distant, glowing a deep and warm color of a plum. Last week, almost four years later, Larry and I headed out of town again. 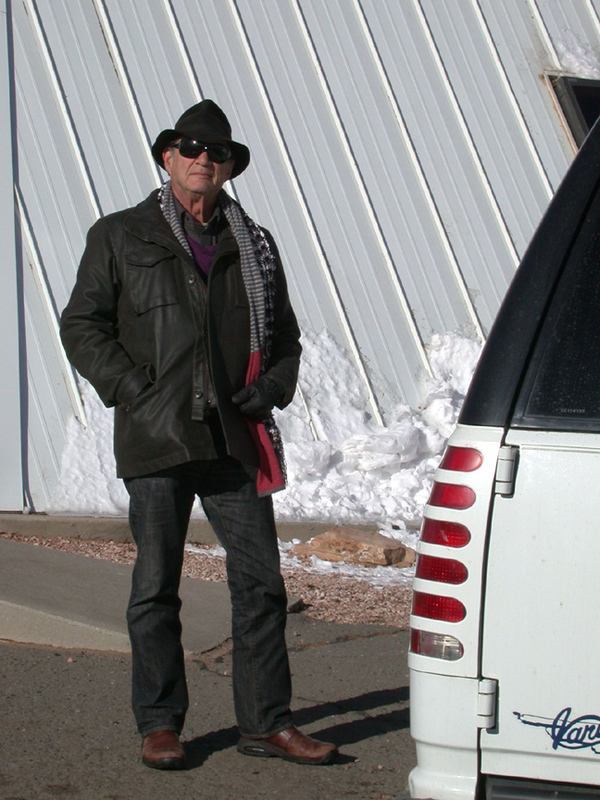 I was going to Taos to attend his 70th birthday. This time Larry chose his preferred route—up the 405 north to the 14 east, then through the Mojave Desert and into Arizona. I had already taken note of the numbers and capacities of our vehicle. The Mighty Time Machine, our ride through the freezing high desert, holds forty-three gallons of gasoline, has two batteries, and is capable of hauling a whole stack of 4 x 8 foot sheets of plywood. Larry’s rig is outfitted for the road, and everything is within arm’s reach. He’s got two cell phones strapped into the visor, and a CB radio turned on—with the volume down low. There are cigars and CDs close at hand, and drinks are to the right and behind the seat. We had one passenger this time, Larry’s dog named Pinky. Like a well-traveled old friend, she slept quietly on the back seat. Traveling with a dog is something that I love, as silent companionship and a sense of adventure are perfect for exploring new territory. A well-traveled dog just seems to know when the rest stop is coming up, and can smell the new scents, as well mark some territory of her own. 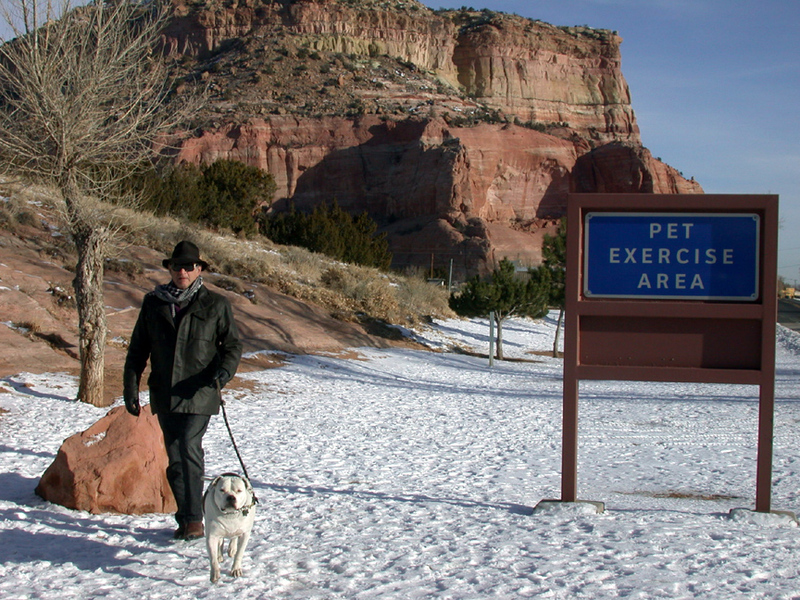 Pinky and Larry found some great spots to take a short walk and admire the architecture of the Arizona rest stops. I took my turn driving this time, from the California border to exit 185 in Arizona. After realizing that I was too sleepy to continue, Larry took the wheel again, and I slept for a good 3 or 4 hours. When I woke up, Larry told me that we were going to stop for a little breakfast and some gas. We were right at the Arizona—New Mexico border. I heard him say, “I just want to stop here at this store, and there’s something I want to show you in there.” I was definitely ready for breakfast, and ready for the next adventure, too. 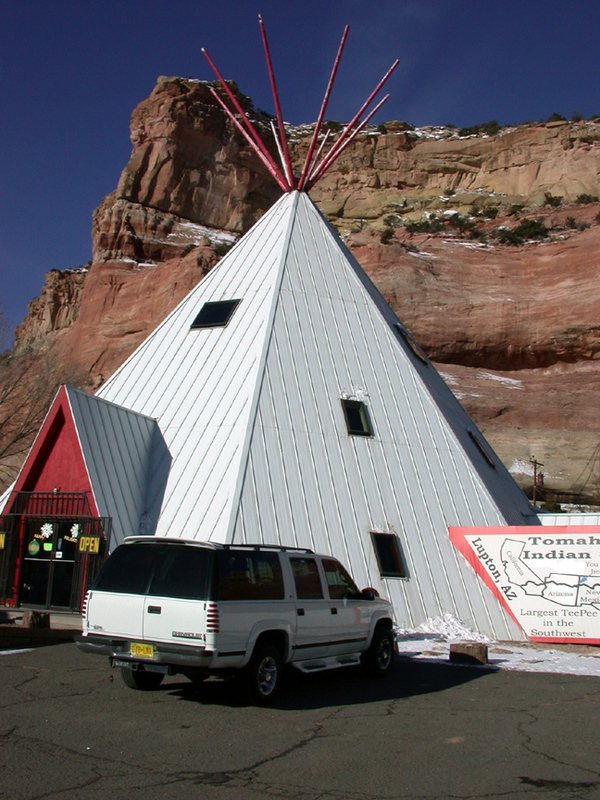 Except I could not imagine why Larry wanted to stop at the Southwest’s Largest Teepee, at the side of the road. 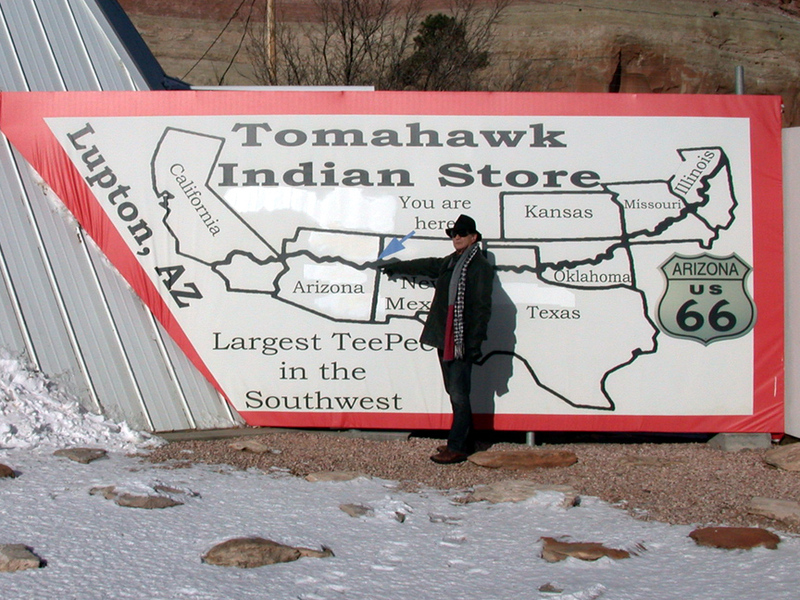 It turns out that the Southwest’s Largest Teepee also houses a huge cigar store. Have you ever seen a picture of Larry Bell without a cigar? He is indeed a cigar aficionado. And the proof was apparent when we opened the door and walked into the shop. 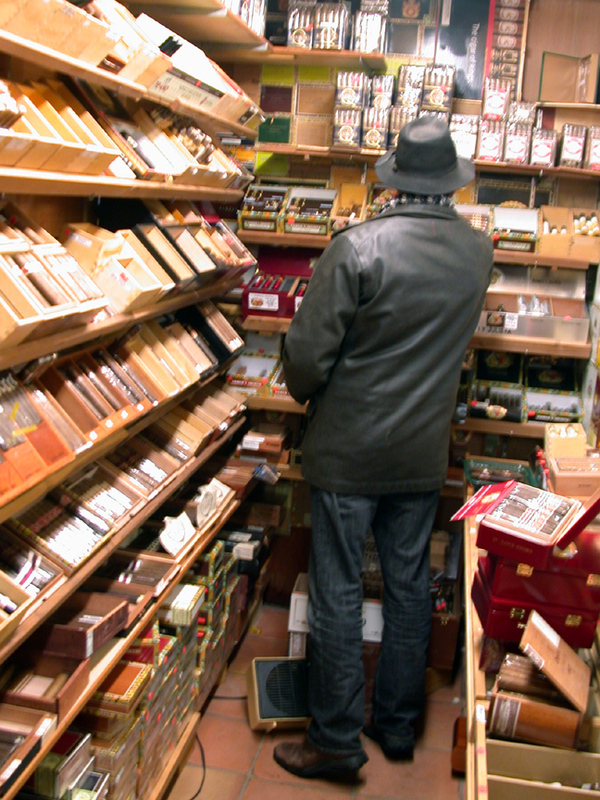 The owners, who were just opening up for the morning shift, quickly said, “Larry, your order just came in.” I was treated to a little tour of the humid environs of a tax-free tobacco haven. That was just our first day on the road. A friend sent a photograph of the Virginia woods a couple of weeks ago. Dark tree trunks dominate the foreground with dramatic verticals. A center of light, clear, open space, like looking into stained glass, shows the richly cultivated landscape. It reminded me of my September trip to rural central Virginia, where my family gathered to bury my oldest brother. When I think about my loss, I am comforted by knowing that he was laid to rest in his favorite land. I take landscape photos when I am on the road, and I wonder about my connection to the land of the west. Landscape is such a powerful bond for me. Northern California holds a place in my internal landscape, as I lived there for a decade or so. A rugged coastline, with expansive views of rocks and water, or a stunning view of coastal mountains, has always been a source of strength for me.